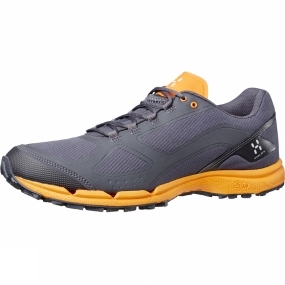 Hagl�fs' Men's Gram Comp II Shoe is a minimalistic trail-running shoe, designed for excellent performance off the beaten path.The Rock Protection plate protects the soles of your feet from rocks and branches and TPU reinforcement protect your toes and heels from scuffs and scrapes. Non absorbing fabrics maintain a low weight in wet conditions and minimal stitching reduces the possibility of irritation during longer runs. GEL rearfoot cushioning provides good shock absorption, a Wet Grip Rubber sole improves grip in wet conditions, while AHAR+ rubber Asics High Abrasion Resistance Rubber on frequent contact areas ensures durability.